Unique cottage with garden and Private Parking. Just one minute's walk from Mousehole Harbour. 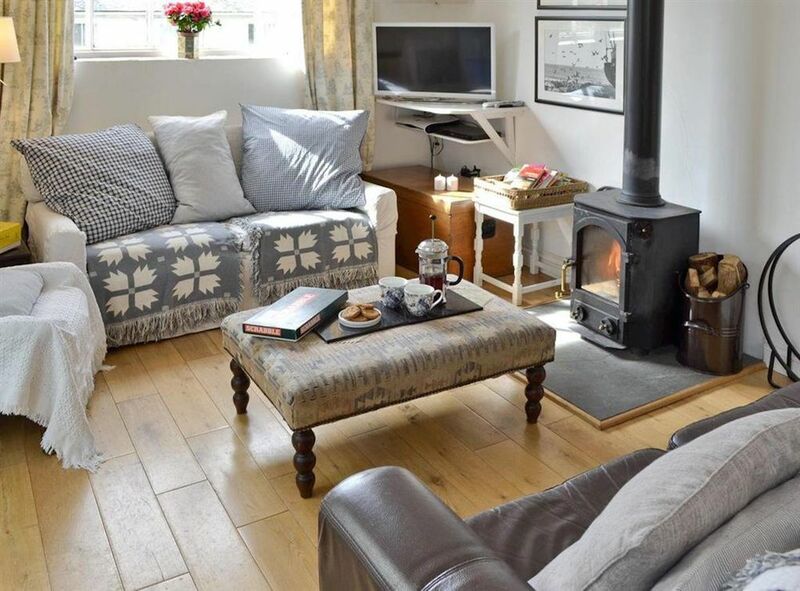 The cottage is single-storey, light and bright, with comfortable, stylish furnishings .The sitting room has oak floors, two sofas, smart TV and a wood burning stove for winter evenings. Landline telephone. A fully equipped kitchen for those who like cooking, with range cooker, dishwasher, Le Creuset cookware and all the utensils you could wish for. There are two bedrooms - one with two single beds, the other with a luxury kingsize bed (5ft wide) and television. Netflix available. Quality linen and towels are all provided. Tiled bath with overhead shower. Laundry room with a washing machine and drying rack. Secluded outside terrace off the kitchen with table, 4 chairs and a Chiminea for barbecuing. There is another terrace with table and chairs at the top of the lawned back garden, while a further table and two chairs sit within the front garden. Our family and friends have always loved coming to Mousehole and enjoy the beauty and charm of the village and Harbour. We enjoy walking and painting on the many lovely beaches nearby. It is a very friendly village with shops, art galleries, a pub, post office and several restaurants serving great food. Mousehole is a great place to de-stress and relax, walking round the pretty streets and enjoying the friendly atmosphere. We love the Sea Salts and Sail Festival held every two years and the Mousehole Lights at Christmas. When you stay at The Old Exchange there is no worry about parking, we have our own private space. The cottage is comfortable, modern and is very well-equipped in order for you to enjoy your holiday. Large garden with two patio areas with table and chairs to relax in. We can park in front of the property and unpack after a long journey (parking is rare in Mousehole). Sitting in the garden behind the house in the evening, watching the sun go down. Bathroom with slate floor, white tiles. Bath/shower, W.C. Heated towel rail. Electric shaving point. Lit mirrored cupboard.Electric fan heater. Drying rack. Electric drying rack. WiFi , Landling for guests convenience- Mousehole has limited mobile reception. Spacious living area with oak floors, landline, wifi, "smart" TV, Netflix DVD, books, games. Two large comfortable sofas, armchair. Wood burning stove with free logs supplied. Dining area. Well-equipped with Le Creuset, Electric hand-mixer. Blender,/ Steamer, garlic crusher, grater, etc. Very well-equipped with range cooker, dishwasher, fridge freezer, microwave, toaster, kettle, espresso coffee machines, cafetiere, blender, mixe Extensive range of cooking utensils, quality china. Large farmhouse table with seating for 6. 2 Televisions - Samsung smart TV in sitting room, TV in main Bedroom. The cottage is detached with a garden at the front and large lawned back garden with table and chairs.. Sun-trap Patio area with dining table and chairs outside kitchen. 1.Seating in front garden - table, 2 chairs. 2.Terraced area off sitting room - large table 4 chairs. 3. Back garden, terraced area above lawn, with views of the hill - Table, 4 chairs. The Old Exchange is a rare cottage for Mousehole having the luxury of private parking. Wonderful not to have to pull suitcases up and down hills from village car park. The cottage combines vintage and contemporary design to provide a comfortable, welcoming holiday home in a beautiful setting. Welcome basket with bread, butteggs, milk, tea, coffee Large Parking space. Front garden, lawn at rear of property and sun-trap patio eating area accessed from the kitchen with large table and 4 chairs for enjoying alfresco eating and sundowners. Chiminea. Utility Room: Separate Utility room - Washing machine, iron, board and large overhead drying rack. Cleaning / Towels / Linen / Maid service: All cleaning, heating, logs for woodburner and linen and towels provided. Egyptian White Company cotton sheets, goose-down duvets, white towels and tea towels, oven gloves. Housekeeper local. Cleaned weekly. Welcome hamper with eggs, bread, butter, milk, tea, coffee and wine. Again this location provided a good base and the parking space was invaluable as, with the lights and the fireworks, Mousehole is very busy over New Year. The cottage is well equipped, with plenty of light and space. In the colder weather it would be good to take a pair of slippers as the tiled floor areas can be chilly underfoot! We really enjoyed making use of the log burner this time around and appreciated the logs provided! The owner is really helpful and full of advice for things that are going on in Mousehole. We are very pleased that you had another good holiday in The Old Exchange and enjoyed the village over the New Year. Thank you for your review and glad you found the woodburner useful. Hope you will return once more. Fantastic location, close to the wonderful harbour of Mousehole. Lovely cottage with gorgeous open plan living area. Right next to Mousehole harbour and all the little shops. Ideal location to explore this beautiful part of Cornwall. Would highly recommend. as a guest and would welcome you on a return visit. Absolutely lovely little cottage. Clean, comfy, really well-equipped and with its own parking, which is a godsend in Mousehole. Perfect location just a minute’s walk from the harbour, with its great cafes, pub etc plus, importantly, first class cream teas & delicious ice creams just round the corner! The kids loved heading down to the rock pools & the little play area just up Foxes Lane was handy too, while the Solomon Brown Hall down the road has lots of fun stuff going on. Mousehole is such a great base for exploring this part of Cornwall and we felt very lucky to be spending part of our holiday in such a lovely cottage. Mousehole to be the perfect spot for a family holiday. Hope you will return in the future. Great holiday in lovely holiday home. Ideally situated, just a couple of minutes from the harbour. Private parking in front of detached holiday home was perfect. House is very comfortable and homely. No passing traffic meant the house was very quiet. What's not to like!! We would definitely hope to stay here again on a next Mousehole holiday. We are so pleased you had a great holiday in Mousehole and that you found The Old Exchange perfect for your stay. We hope you will return. 2 minute walk to Mousehole harbour where there are two safe beaches. Porthcurno - golden sands and turquoise water is a 10 minute drive. Minack open air theatre. Sennen Cove and St Ives great surfing beaches are a short drive. South West Coastal path from Mousehole to Lamorna Cove. Train Paddington to Penzance (approx 5 hours). Penzance has bus service to Mousehole every 30 minutes. Newquay airport is 35 miles. Car: Approx 5 hours from London. Property has private parking. Air: Daily flights from London Gatwick to Newquay, flight time 1hr 10 mins. From Mousehole- Newlyn 1 mile, Penzance 3 miles, St Ives 13 miles. Close to Porthcurno and Sennen surfing beaches. Pack your walking boots, there is a coastal footpath to Lamorna Cove from Mousehole. Maps and books at house. Mousehole has great restaurants, The Coastguard Hotel has garden with amazing sea views, and bistro dining with Michelin trained chef at 2 Fore Street. Village shop and Post Office. Delicatessen, art galleries and great gift shop Seawitch Stores. Booking Notes: Contact owner by e-mail or phone 07754828761 for booking details and any questions. 20% deposit payable at time of booking and total payable 8 weeks before arrival date. There is an additional £200 security deposit payable which is fully refundable once the keys have been returned and the cottage left in good order. Short breaks possible in low season. Changeover Day: Changeover day Saturday Arrival after 3, Departure by 10. Local Housekeeper. Notes on prices: £30 charged for pet.